So, that's it. Summer 2012 is wrapped up and in the bag. Even the hardest of hard cynics would have to admit that London has gone through an extraordinary few months. 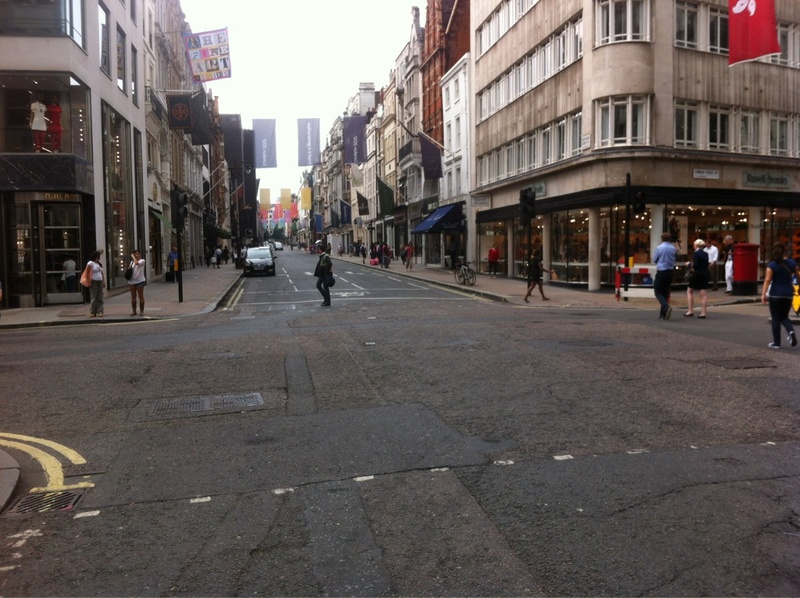 If, like me, you've unashamedly had an incredible summer, it will take some time to digest and really understand what London 2012 has done for and to our city, but when it comes to cycling and our streets a few key points stand out. Cycle parking was abundant - if you could find it. There were tens of thousands of secure, guarded temporary bike stands at locations and venues all over London - hoorah! But knowing where they were (and therefore your destination) before you set off was almost impossible if you followed the official maps and guides. Still, exist they did and used they were. However, as an existing cyclist who can get by on local roads, the idea of looping aimlessly round Victoria Park in search of a secure cycle park before having to walk 20 minutes to reach the Olympics proper was no match to the lure of a free travel card. I went by train, and so, it would seem, did everyone else. Chinese athletes on the Central Line. New Bond Street and Berkeley Square at 5.45PM on Friday 27th July 2012 - normally choked with traffic but on this night strangely deserted. Olympic Gold medalists Dani King (winning!) 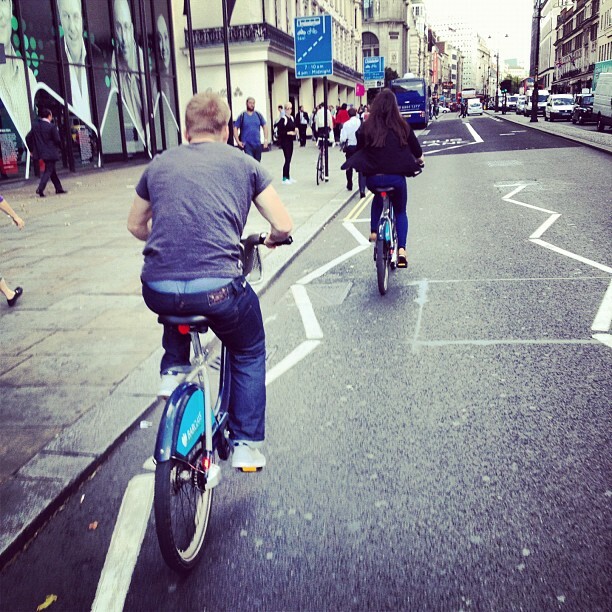 and Phillip Hindes have a Boris Bike race in London yesterday. There was a tragic death of a cyclist on the outskirts of the Olympic Park which we still don't know the full details of. And of course the Games kicked off with the most ill-fated and poorly chosen Critical Mass route of all time. 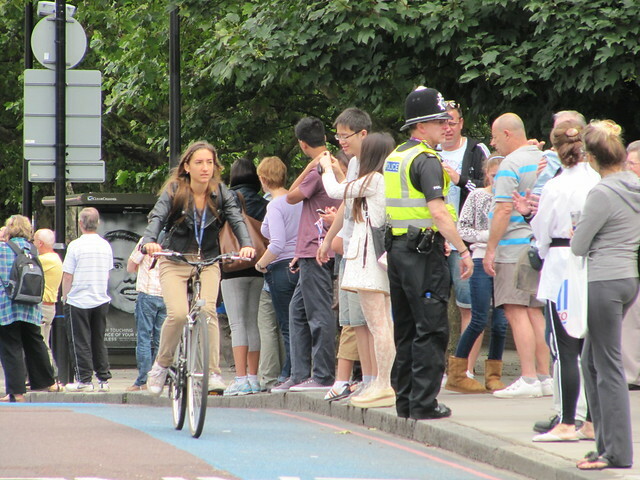 Plenty of people went along to CM to cause chaos and drag it east to Stratford (for the very first time) - these people are idiots, but idiocy is no excuse for the appalling conduct of the Met Police in arresting 182 cyclists that night, nearly all without charge. I hope the need for a full and pubic investigation in to what happened that night won't be buried beneath the mountains of discarded bunting and Union Jack flags. Meanwhile more innocent visitors on bikes were abroad (were from abroad!) in London lending a festive air to our streets. Just yesterday I saw a "Team Brazil" green and yellow Chopper bike being locked up on the Gray's Inn Road which has to be an instant Olympic legacy if ever there was one. Having seen the crazy Russian, Spanish and Ukranian uniforms that they produced - not to mention the wild Beach Cruiser Bikes they had in town for the Games - the last word in cycle safety apparel should really go to garment supplier Bosco. There will undoubtedly be a post-Games biking bounce, much hyped by media circles and campaigning commentators. (First person to use the phrase "bike boom" gets extra points!) If we're lucky, some of the new cyclists might even stick around past the first frost of Autumn. But for me, the most interesting aspect of cycling and the Olympic Games came, in fact, before the Opening Ceremony had even started. 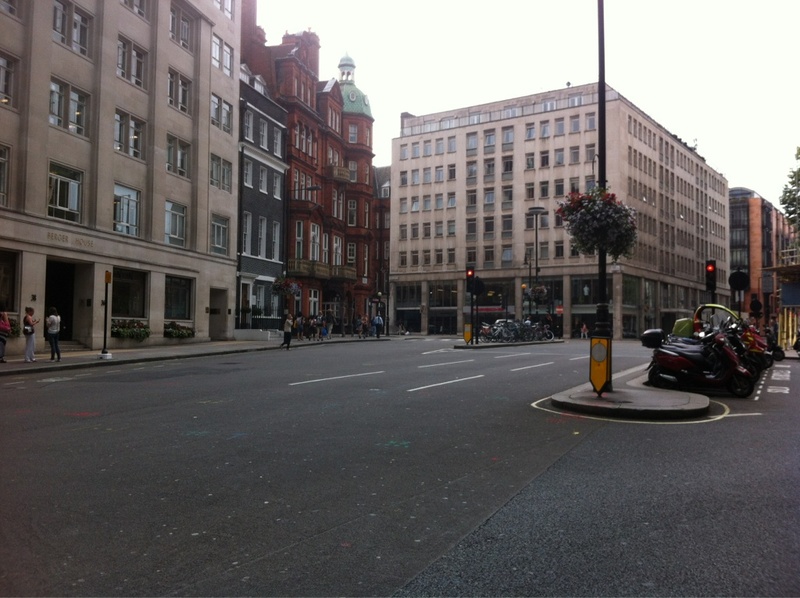 I was lucky enough to catch the Olympic Torch three times as it criss-crossed the city. Millions turned out to see this rolling roadblock of sponsor juggernauts and local heroes carrying the flame. It had all the ingredients of a classic city-wide grid-lock recipe. But once the flame had passed and the crowds began to disperse it wasn't tailbacks of cars that I saw following the parade, but hundreds and hundreds of bicycles. On Regent Street on the final day of the relay I counted some 300 cyclists caught up behind the flame and who were a sight to see in their own right. Change is coming to the streets of London, and it is coming from the bottom up. It's coming and our city leaders don't know yet that it has already started to arrive. 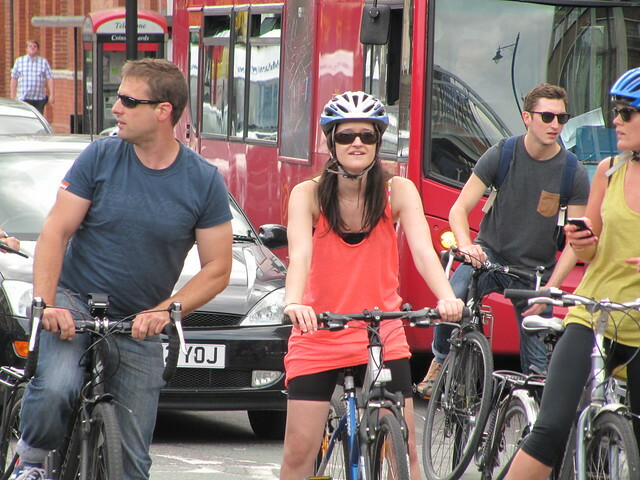 It's fantastic to see, and I'm thrilled to see so many other cyclists on our roads. We live in interesting times! Onwards, to Rio 2016, where they are having a bike boom of their very own. 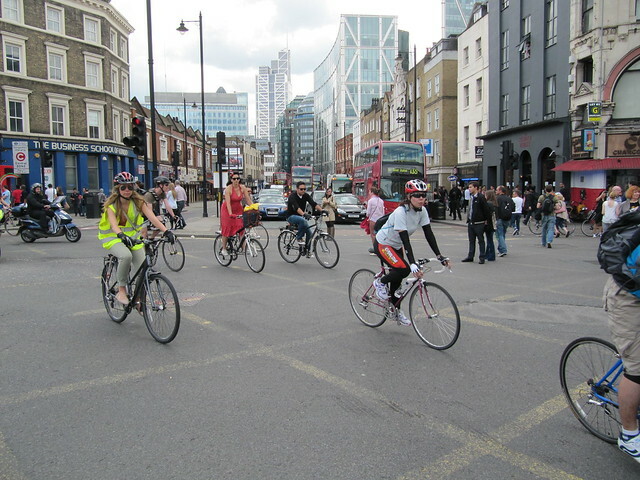 Moments after the flame arrived in Shoreditch - nothing but tailbacks of bicycles. A good tour d'horizon. Perhaps worth mentioning the huge crowds that attended the four road cycling events - which were some of the few events for which you didn't need a ticket. I was at Richmond Park for the Mens Road Race and the park was closed to all traffic (except bikes) and the result was a veritable festival of cycling down there. Sunshine, picnics, and then for a few seconds, the race itself. I also went along to the Time Trial, down at Esher. It was at least three people thick all the way down. I don't think the world has ever seen a bigger crowd for a time trial event. 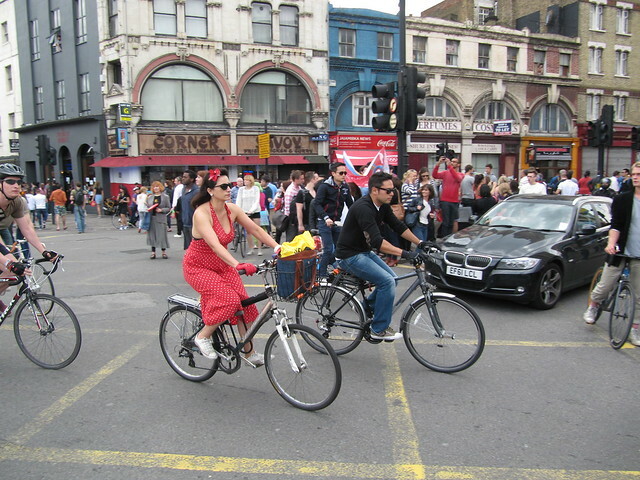 Most were cyclists, many had come on bikes on the day. On the downside was the decision of a few (but not all) train companies to have a blanket ban on all bikes on trains for the duration of the Olympics and Paralympics. A total over-reaction and a great shame. Southeastern and Southern were the worst culprits. To their credit, South West Trains relented and allowed bikes on board, where capacity allowed. Jack, you're right of course - the crowds at the public cycling events were phenomenal. On the first day of the Games I was on Constitution Hill for the men's road race and the crowds were so deep all we saw was a flash of the top of helmets as the peloton passed. It was the same for triathlon as they cycled around Hyde Park. You're right - never before has a time trial (potentially not so interesting to watch!) had such a large public audience! As for Southern and Southeastern - no friends of bikes there, I'm afriad. I must say that – to my surprise – the whole experience of transport in the Games era was positive. I only attended one event, but getting there, being there and getting home afterwards all went without a hitch. Sure, the Stratford site was very crowded and we had to queue to get into the park, but it all went smoothly and steadily, the volunteers were just brilliant, and the information was comprehensive and easy to source. My only gripe was I thought the catering was overpriced. Oh, and I absolutely still fail to understand how anyone can be “proud” to accept only VISA! 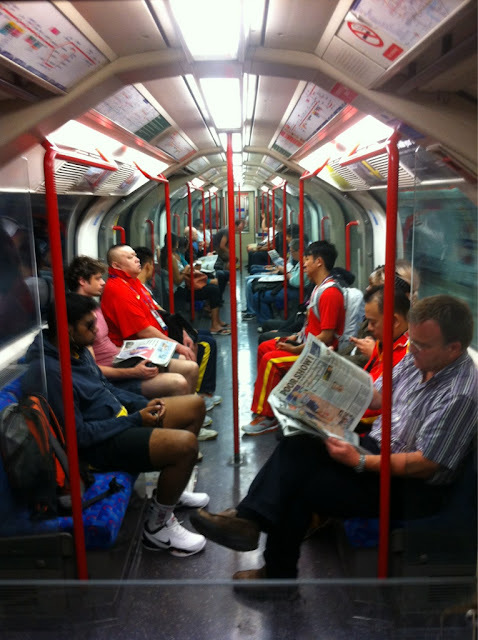 We took the tube, Jubilee Line between Stratford and Waterloo. I doubt I would have contemplated cycling anyway, but when your games ticket includes a one-day all zones travelcard the choice is fairly obvious. Otherwise, at work, I had two occasions where I needed to take a taxi across town to a meeting, both on the first Monday. A colleague had allowed 30 minutes to get to the other end of Kings Rd from Fleet St, which I thought was just not do-able, but in fact we made it, following a zig-zag route through St James and Mayfair to avoid the games lanes. I amused myself by counting private cars in the traffic. I ignored licensed hire cars, and perhaps inappropriately I also ignored parked cars, but on that basis in the entire return journey I counted only three! Et in Arcadia Ego! My cycle journey was also far more pleasant than usual, with the Zil lanes really not affecting me adversely. The traffic volumes on the available lanes adjusted to the reduced capacity – as we all knew it would – so that the environment was no more hostile, probably less, than usual. Given that the city coped just fine, I’ll add my voice to the chorus – why can’t we keep it that way, and hand over the games lanes to bicycles?